This article is about the GMC Terrain sold since 2010 in North America and 2011 in the Middle East. 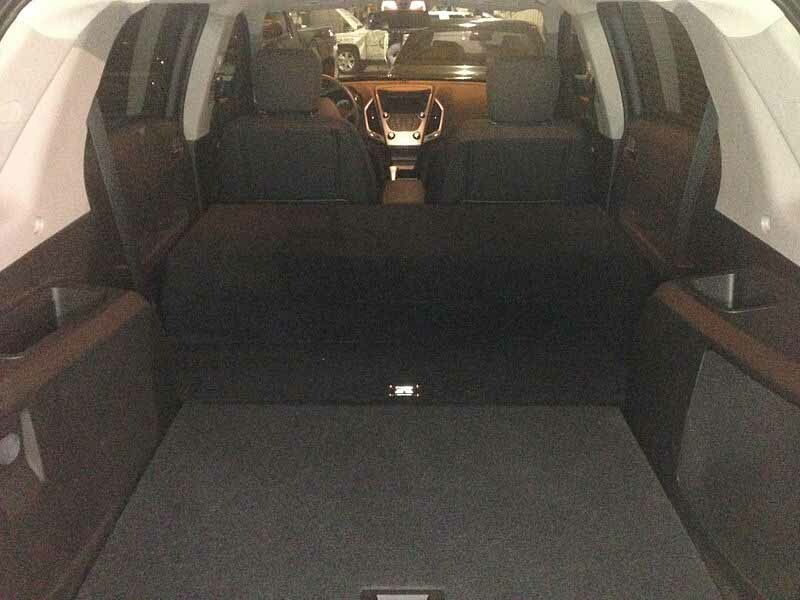 For the GMC Terrain sold in the Middle East between 2008 and 2010, see Opel Antara. 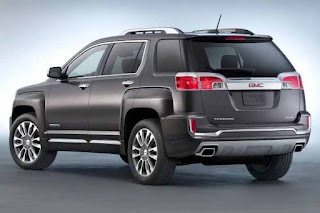 The GMC Terrain is a mid-size crossover utility vehicle (CUV) produced by GMC. According to General Motors (GM), it replaced the Pontiac Torrent which was sold in the same dealerships prior to GM dropping the Pontiac brand. Like the Torrent, the Terrain is based on the Theta platform. The Terrain slots below the Acadia as GMC's smallest SUV. Although the preceding Pontiac Torrent had the same Theta platform, the Torrent was a rebadged version of the original Chevrolet Equinox from 2005–09, while GM decided to differ the look of the Chevrolet Equinox with its 2010 Terrain and still use the Theta platform. 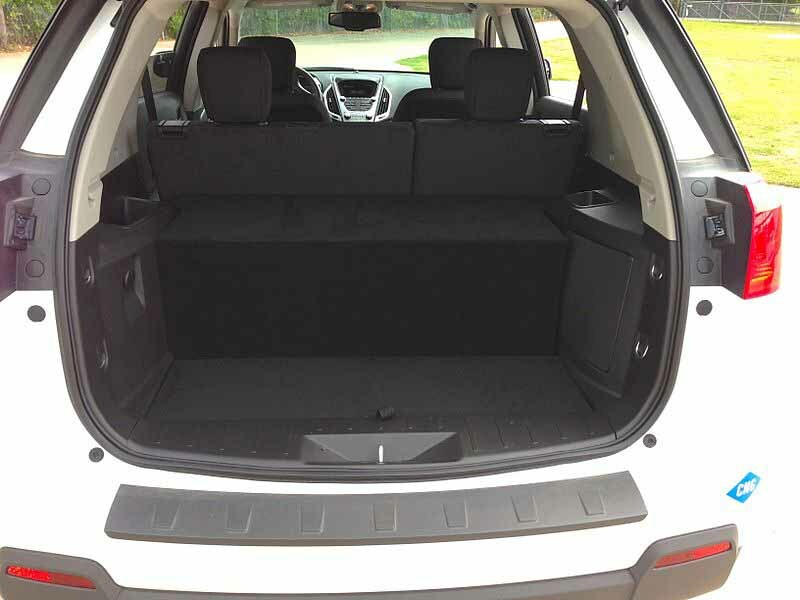 The Terrain shares engineering with the 2010 Chevrolet Equinox. While the two vehicles use the same platform, drivetrain, interior components, the Terrain's body panels and standard features differ from those of the Equinox. The 2010 Terrain debuted at the 2009 New York International Auto Show. 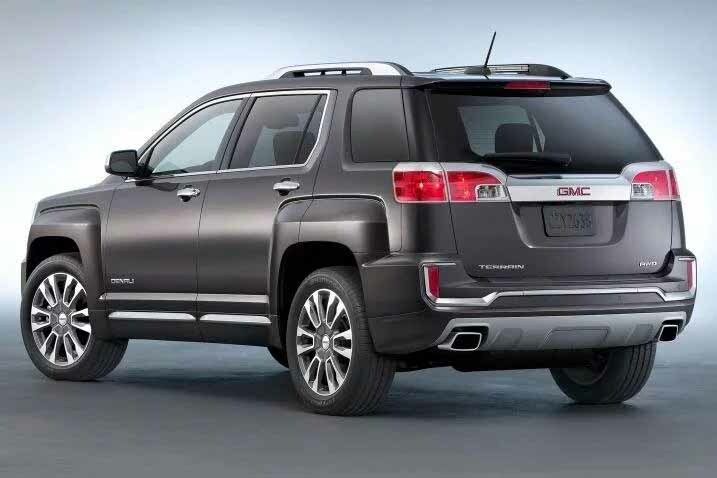 For the 2013 model year, the GMC Terrain introduced the Denali trim which consists of more chrome trim and slightly improved interior quality, the 3.6L SIDI V6 that is shared with the 2012 Cadillac SRX in place of the optional 3.0L SIDI V6, and firmer front struts. The Denali also offers cross-traffic detection, blind-spot warning and a power passenger seat as options. 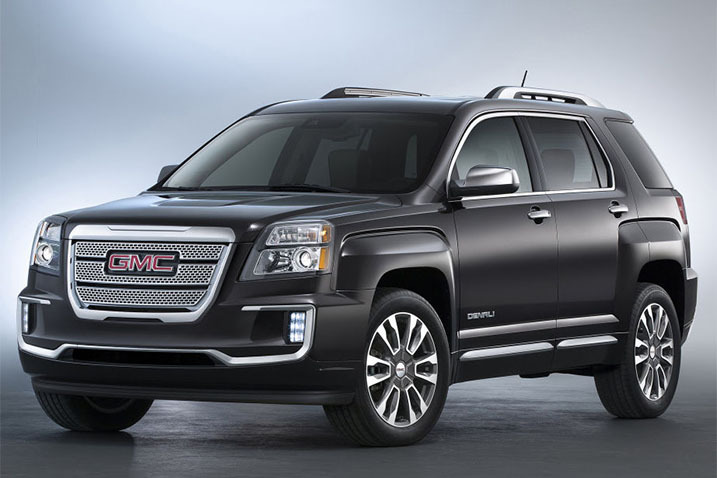 For 2016, the GMC Terrain received a facelift as part of its first mid-cycle refresh along with the Equinox. The refresh consisted of new front and rear fascias, new grille, a power dome hood, LED daytime running lights, new wheels, a new gear selector, a second storage shelf under the dashboard, as well as deletion of the door lock buttons from the dashboard. In 2016, GMC introduced the Terrain Nightfall edition, which replaces chrome with gloss-black finish on the grille surround, the front and rear fascia accents, the license-plate surround, mirror caps, and roof rack, as well as charcoal grille inserts and darkened headlights pulled from the Terrain Denali. The Terrain Nightfall comes with revised rims with machined faces and black spokes. The Terrain Nightfall trim is available on the SLE-2 and SLT trim levels and is available only in Onyx Black, Summit White, Graphite Gray, and Crimson Red. 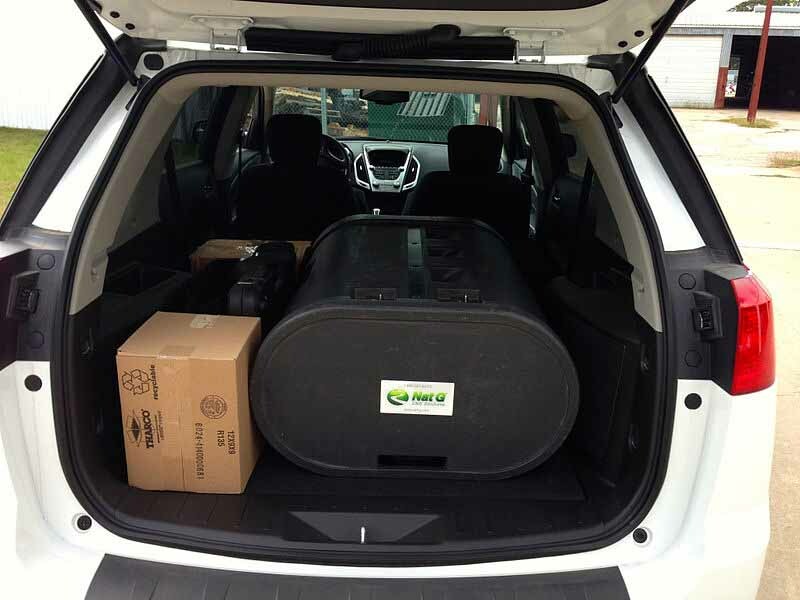 In 2013, Nat G CNG Solutions in Houston, TX and AGA Systems in Salt Lake City, UT announced that they had begun offering a Compressed Natural Gas (CNG) version of the Terrain and the Chevy Equinox using the 2.4L Direct Injection engine. The natural gas version is a "bi-fuel" CNG vehicle, meaning it runs on either gasoline or natural gas, giving it extended range. The Terrain/Equinox were the first direct injection natural gas vehicles ever approved by the US EPA. The CNG version was available for newly purchased Terrains through select dealers or as a retrofit on 2013 and 2014 models. 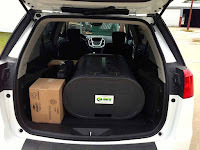 Nat G CNG Solutions® offered the vehicle in two options: a two-seater "cargo version" and a five-seat "passenger version." The cargo version has an 837-mile combined gasoline / natural gas (9.2 gge of CNG) while the passenger version has a 775-mile combined highway range (6.8 gge of CNG). The companies claimed that the natural gas version had tested at the EPA lab at 31 mpg highway on natural gas and had achieved a Bin 3 emissions equivalent to the Toyota Prius. 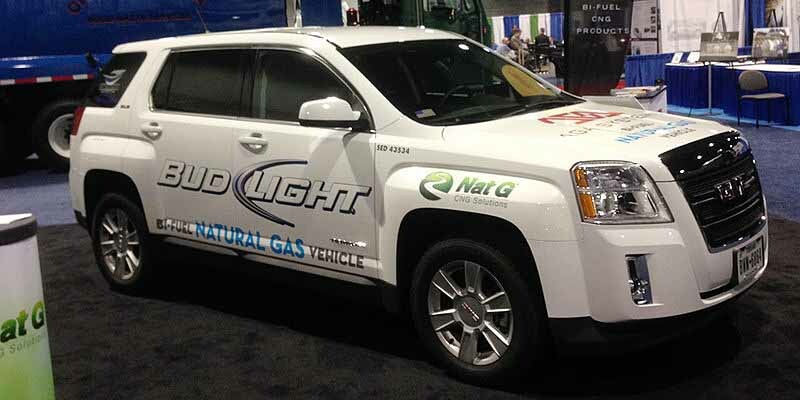 Silver Eagle Distributors, L.P., the nation’s largest distributor of Anheuser-Busch products, was the launch customer for the natural gas version with an initial order of up to 100 of the natural gas versions. Last updated on 2 January 2017 at 18:52.